Start a race or a time trial in one of the three available cups and see how far you can go. You can choose between many different vehicles and even some animals before you start the race. 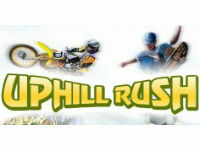 Grab cash as you race through the intense 4th installment of Uphill Rush.